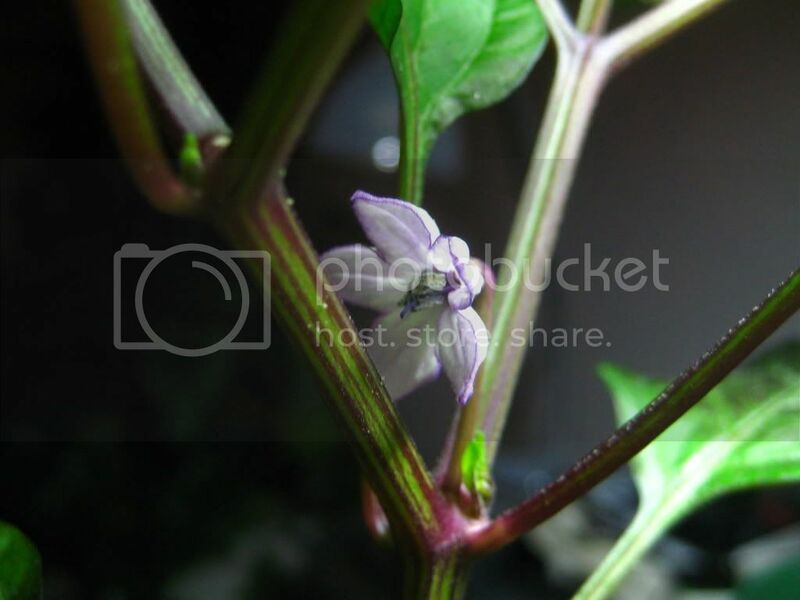 My Filius Blue pepper plant that I started from seed some time in June is sitting next to my computer monitor under a fluorescent desk lamp, it is now flowering and even has 1 pepper growing. Wow, csvd87! That is a gorgeous pepper flower. It looks like a houseplant. I had to look it up online, never having heard of that kind before. Cool. You'll have to post peppers when they are blue. How odd is that? They are supposed to be a purpley-blue, but it will be neat when there is that mixed with yellow and red. Hopefully it will continue to produce, it never dips below 65 in my house, and it is under a light. 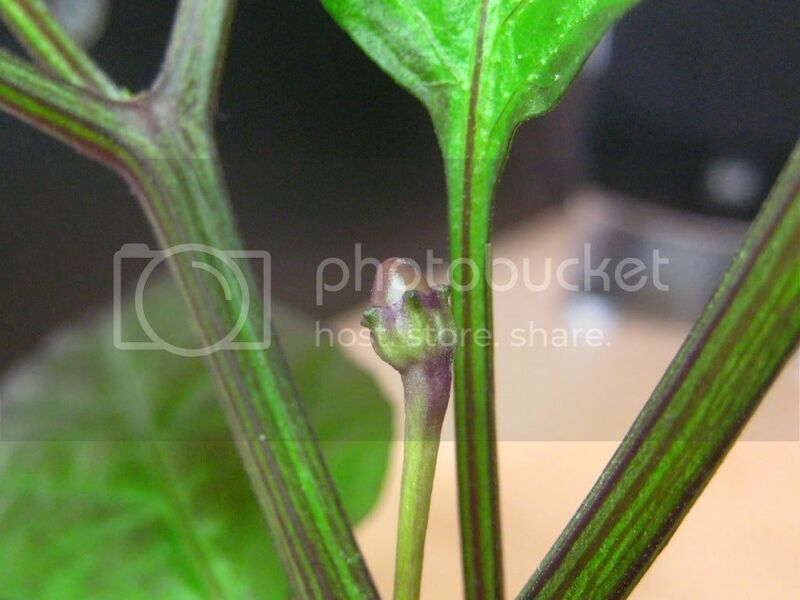 My Black Pearl pepper is next to it, but it is at least 20 to 40 days away from maturity. 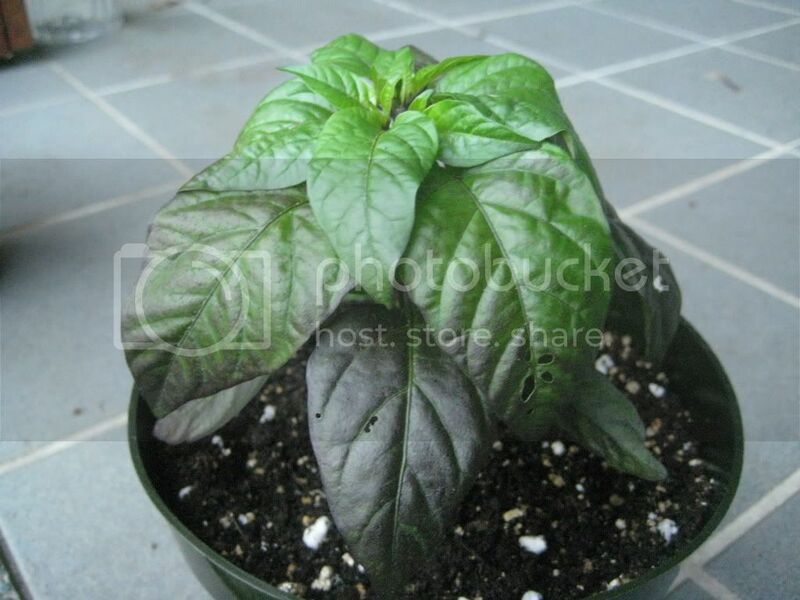 Also, its not looking like a black pearl, but maybe it needs more heat/sun to get the foliage nice and black. How do you get it pollinated? Pepper flowers, like tomatoes (they are of the same family) are what is called "perfect". This means that, among other things, they have both male (stamen) and female (pistil) parts on the same flower. In short, the flowers are self-pollinating. All you have to do to pollinate the pepper flowers is just tap them a few time with your finger. Aren't they great garden5? guess you could do it with eggplant too... although you would need to find a dwarf variety or keep the eggplant well pruned. That plant is really pretty, great job! CS, have you been giving your plant any fertilizer? Garden5, yes, every once in a while i will give it a watering with MG's Tomato Fertilizer(because it has less nitrogen than the all purpose, having pretty good success with it so far, but will probably go with something a little less potent when I run out) and i'll mist it with an epsom salt solution. 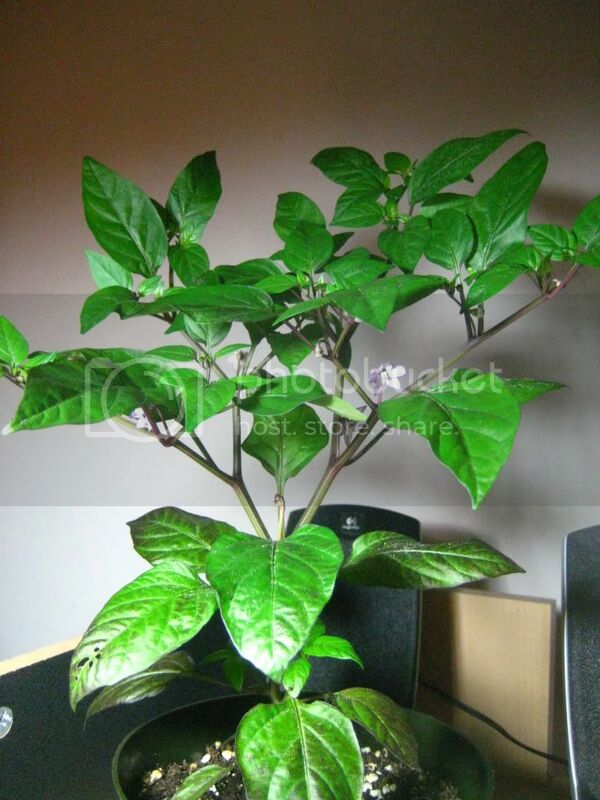 Nice plant, that thing is looking great especially for just being under a desk light. Good job, I agree you need to post some pics of those blue peppers when they are ready. OK, now, I noticed that you said you kept it under a light. I'm wondering how well a plant would over-winter without supplemental light, just whatever comes through the window. I was looking out at some pepper plants I have in pots OUTSIDE and thought about you. I have a few that are 1/3 that size. You could take off a stem of that one and that would blow mine away. What is the secret, c'mon you can tell us. If I knew the secret I would tell you, but this is my first year, maybe I'm some sort of guru. I started it in a 4 inch pot under a 100w fluorescent CFL in a foil lined cardboard box with a hole in the side for the lamp to poke through. it was under 24h light.. and has been ever since i sowed it. I really believe in using the lights to help pepper seeds germinate, ever since reading somegeek's thread, it only takes about 6 days tops for most pepper seeds, and that is using Miracle Grow's Seed Starting Mix. other than the MG Tomato Fertilizer there is some Worm Castings in the potting mix i used, which i don't know where to find anymore since the bag was like 10 years old or something. AHA! I'll bet it's the worm castings. I can remember a thread where a member (DV?) did and experiment with seedlings and found that having some WC in with the mix made those seedlings grow way better than any others. ....Or, it could just be beginner's luck . "germinating under lights" next year.